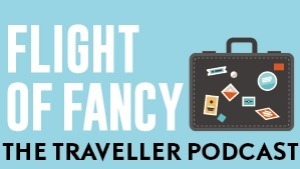 "Muizenberg is the epicentre of diversity," says Daniel Blaauw of Muizenberg Tours and Travel. "It's a really connected community. You'll always find a happy face, a friendly person to talk to, something interesting on the beach." 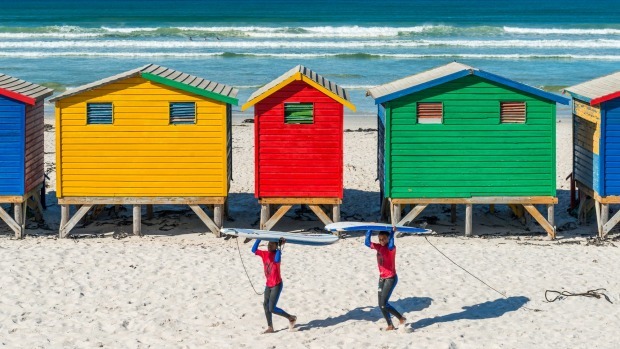 I can see what he means as we gaze at the beach, with its colourful huts and lively restaurants, which has made this suburb of Cape Town a magnet for surfers. It's a sunny weekend and surfers carrying boards head for the waters of False Bay. Other people cheerfully promenade along a seaside walking path. Blaauw's Muizenberg Walking Tour, offered in conjunction with the local historical society, is a 90-minute journey through this area's fascinating backstory. Having arrived via the city's dilapidated suburban train system, I've already encountered the impressive 1913 train station. Reminiscent of a town hall, it boasts a decorative clock tower and a couple of rusting cannons on the platform facing the beach. They're a reminder of the 1795 Battle of Muizenberg between the Dutch and the British, which led to British control of the city and the nearby Cape of Good Hope. 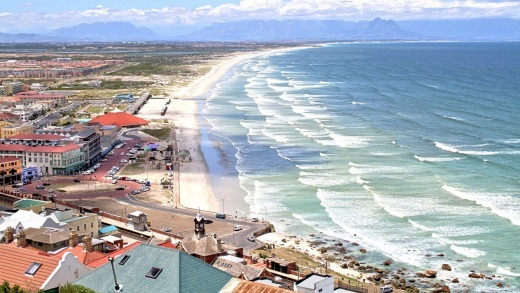 During the 19th century, Muizenberg's mild climate made it a popular seaside resort, which led to the location's close association with surfing culture. Here, in 1919, Heather Price was the first South African to be photographed riding a wave while standing on a board. "Muizenberg is the oldest surf town in Africa," says Blaauw. "If you come here on a day trip you can hire a board and get involved with the surf community, which is really like getting involved with the community. All the surf instructors are locals." We walk along a coastal path between the railway and the bay passing a plaque marking the Surfers' Circle Walk of Fame and a sign with shark safety information in three languages: English, Afrikaans and Xhosa. Our next stop is Rhodes Cottage Museum housed in a cosy old dwelling with a steep thatched roof. This was the final home of Cecil Rhodes, the arch-imperialist and diamond mining magnate who was prime minister of the Cape Colony in the 1890s. Although he remains a controversial figure in the post-colonial era, his cottage has been restored and decorated with displays about his life and work. Turning back toward the surf beach, we encounter a number of notable buildings along Muizenberg's Historical Mile, framed by the steep rocky hills behind them. There are the remains of an 18th century Dutch fort and Yokohama, a house constructed in 1906 with waterproofed papier-mache walls. Further on are the 1910 Carnegie Library, now a police station; the elegant 1929 Casa Labia which once housed the Italian ambassador; and the 17th century Het Posthuys, The oldest building on the False Bay coast and originally used by the Dutch East India Company as a customs house. Het Posthuys gave Muizenberg its name, via a Sergeant Muys who held a post there. Memories of the Dutch era are also present in nearby Muizenberg Park, a green space set with historic cannons. The tour over, we head a short distance south to Kalk Bay, a gentrified neighbourhood packed tightly between coast and hills. Wrapped around the railway station here is the Brass Bell, a pub with eccentric sprawling architecture. As we sit and have lunch with a view of the bay, its waves occasionally surging against the pub's decking, I ask Blaauw why he's so keen for people to visit his part of Cape Town. "To understand where people have come from, gives you a much better understanding of where people are going," he says. "Muizenberg has been part of the development of South Africa for so long, we want to make its history accessible. "Muizenberg represents so many diverse people who all just gel, there's a common love for history and nature that brings the whole town together. We want to preserve and share that." Tim Richards travelled courtesy of South African Tourism.